Do Buffalo moo? I think they should, they look like cows would look if cows drank whiskey and got into punch ups outside clubs in cold and unforgiving towns in the North so I’ll say here that even if they don’t moo they should. Also I know a Buffalo joke, perhaps the only Buffalo joke, so, what did the Buffalo say to his son when he left to go to school? Bison, get it? I’ll get my coat. 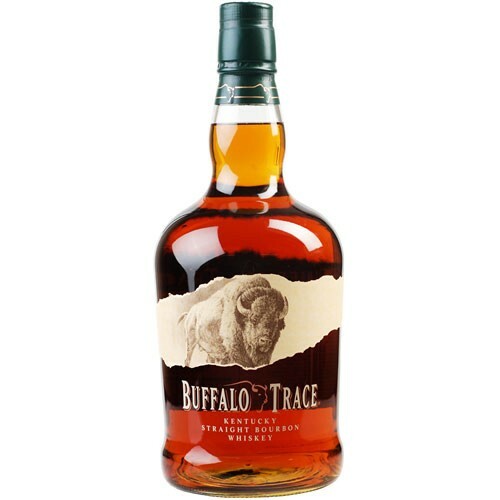 Right then, Buffalo Trace is a Straight bourbon so no funny colouring and again for at least two years in new charred oak barrels it’s now bottled at 40% and is cheap as chips you really don’t want to be paying more than twenty pounds a bottle. Nose. Vanilla, toffee, slight whiff of those charred barrels but this is a light easy bourbon, burnt brown sugar, Chinese All Spice makes a brief appearance. Palate. More toffee, vanilla and candyfloss, a little spice comes in along with the nose, I also taste a soupcon of cinnamon too. Finish. Short and sweet, relaxed and leaving a pleasant oily toffee feel in the mouth. Now I drank this neat but every picture you ever see of Buffalo Trace has a tumbler with ice involved and no doubt it would take ice well. It’s also a cracker for cocktails, I picked up a bottle of this when I finished my bottle of Wild Turkey and worked a treat in my Manhattan and Whiskey Sour.